We have discussed on the GN shaker screen distributor agreement before, today we would like to pick up that topic can continue our conversation. 4. GN Distributor has the right to return maximum 500 pieces brand new GN shaker screens to GN houston warehouse at GN Distributor’s cost, return period is 7 days before the end of the first year’s stock agreement, example: if GN Distributor and GN signed the stock agreement on Aug. 10th,2016, then GN Distributor can return maxmim 500 pieces from Aug. 3rd to Aug.9th, 2017. All cost related to returning those screens to GN Houston warehouse will be borned by GN Distributor. 5. GN will accept those returned GN brand new screens. Stock plan will be proceed based on GN Distributor’s screen demands, so GN Distributor stock qty. can reach to 1000 pieces at the end of the first cooperation year. 6. This stock agreement between GN and GN Distributor will be valid for 2 years unless GN and GN Distributor decide to extend the cooperating period. All the balance credit will be calculated and paid at the end of the second cooperation year within 7 days. Notice: For some screens that not used a lot especially for those old screens such as National screens, they are usually not included in this stock agreement, 100% need to be paid before manufacturing. But for the other shaker screens, such as repalcement Venom screens, Mongoose screens, Derrick screens, GN Solids America LLC has no problem to stock for you. In the future, GN Solids America LLC will stock composite material type (replacement Venom or Mongoose) for GN distributor. 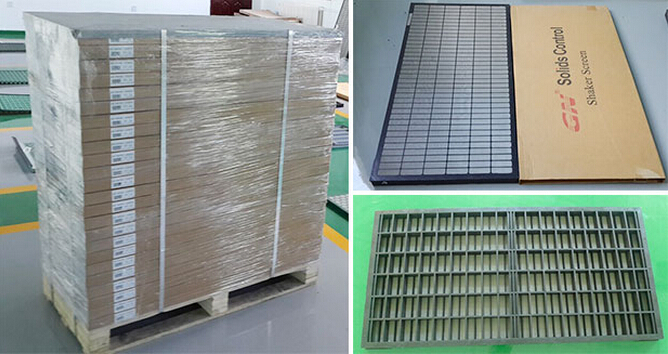 Compare to the metal frame screens, composite material screens can be stocked for a longer time (you could stock for over 2 years without any damage), the life period is longer and the separating performance is much better.